Do you have the fire and desire to witness for Jesus but you aren't quite sure how to start? There are so many different ways a heart can witness to people about Jesus. Working for JESUS is so much fun!! You can get creative with your ideas and ask JESUS to give you the words and to guide you. Bible tracts are an awesome way of reaching the lost! You can make them yourself and have them printed for a reasonable rate at www.vistaprint.com. (I do not endorse vistaprint however, I am only suggesting them because I have used them for years and they have great service). I learned over the years that there really aren't any legit witnessing tracts anywhere that you can purchase that preach the true gospel of Jesus Christ, don't be deceived by "christian" book stores either off line nor online, they don't know Him either, it's just the SAD truth. This is why I would highly suggest making your own as Jesus leads you. If you don't have the ability to design tract cards that you want to print, simply because you don't have the designing software or know the slightest thing about making them, contact me... I'd be happy to design a tract for you, free of course. But Jesus wants you to make witnessing cards/tracts WITH Him..its fun!!! 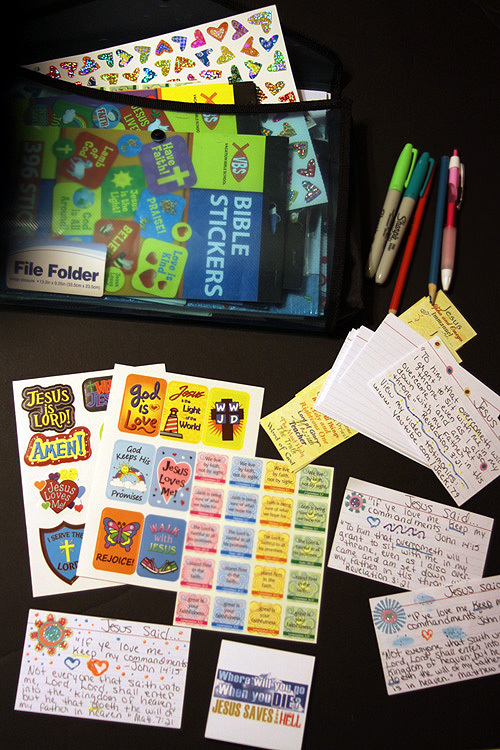 You can make your own witnessing cards/tracts by using sticky pads or index cards, and full-blank cards found at dollar tree!! 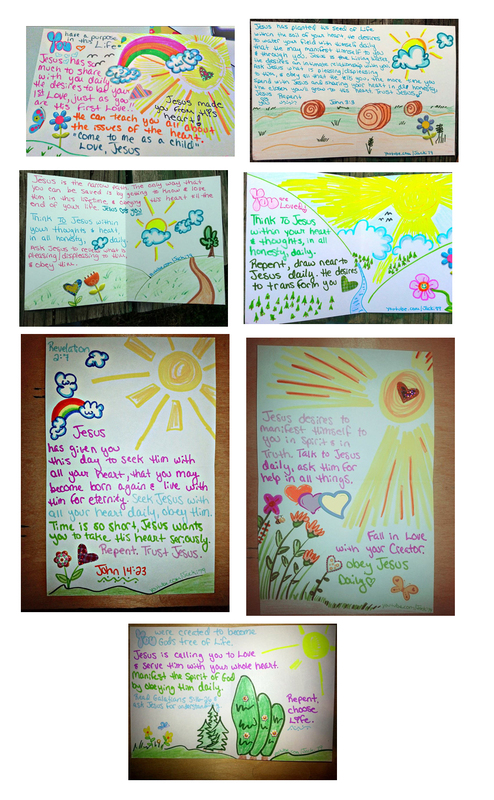 Decorate them, make them personal from your heart and JESUS' heart, you can make bible tracts come to life!! You can write a personal note to someone as Jesus leads you and/or write a verse that the LORD places on your heart and flip it over to write a short message about what Jesus has done in your own life. To get creative, you can put stickers on them, use different colored pens/pencils and glitter pens. It's a fun project that can involve the children! You are welcome to put this website on your tracts/cards or my youtube channel *youtube.com/jacki79* because people will usually have many questions, that way they can contact me, I am a true disciple of JESUS, I am one of His few Godly counselors who is here to help give people His sound counsel and prayer as Jesus leads. 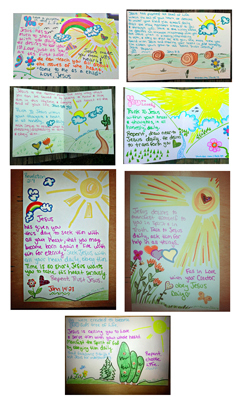 What to do with Bible Tracts. Tracts are great witnessing tool! They will leave the reader thinking about their eternal destination. If you design small business-sized card tracts then they are convenient in size (business card size works great) and you can carry them in your back pocket, shirt pocket or purse, or if you buy $1 blank cards from dollar tree then you can still carry them in your purse or backpocket. You can very easily walk up to people and just hand them one and say something like "Jesus put it on my heart to give this to you". Give them to your family, friends, co-workers, classmates and people you've never met. Here are a few witnessing ideas: If you are visiting a family member or friend, you can place them in their bathroom or kitchen counter before leaving. Going on a car ride with someone? Leave a tract in their vehicle. Always keep tracts handy on you at all times, you can keep them in your wallet, purse, and car. Always remember to have tracts laying around your home at all times in case people come to your front door like sales persons, then you can hand them one! You can place them on coffee tables, in your bathroom, kitchen counters and hang them on your refrigerator in case you have unexpected company, you can use tracts as conversation starters. Outside the home, you can place them on mall benches, newspaper/magazine racks, under windshield-wipers, atm machines, leave them by gas pumps, drive-thru's, leave them on restaurant tables, public restrooms, place them on door handles with a rubber-band or plastic bag, leave tracts on store shelves, dressing rooms, clothes racks, clothes pockets, inside shoe boxes, give cashiers a card, give them to truck drivers and waitresses, give tracts to hotel maids and slip them under hotel room doors, leave them at terminals, hospitals, slip tracts inside worldly magazines and books at stores and all waiting rooms, put tracks on top of gaming tables at arcades, airplane bathroom and seats, place them in claw machines, red movie rental boxes, soda machines, library books, send them with your bills, send them with greeting cards, go bike riding or walking and just randomly hand them to people as they walk by. It's fun to see the many expressions on peoples faces when you had them tracts. Some people will thank you and others may smile. However, there will be times when someone won't take a tract or even say something rude to you, but don't let that stop you from passing out more tracts!! Satan will try to discourage you and make you give up but that's just part of his wicked plan against everyone who witnesses for Jesus. If someone is rude to you, just pray for them. You can purchase KJV full or new testament bibles for only $1 at a Dollar Tree near you! They also have the smaller New Testament KJV bibles which people love. You can leave them on benches or counter tops in stores or pass them out with a tract tucked inside. Bookmarks. You can turn a bookmark into a great witnessing tract! Purchase a bundle of blank or patterned bookmarks then on the backside write a scripture or an outline of the gospel, again you are welcome to include this website, my youtube channel or email so they can contact me. Write a personal message to encourage them to seek Jesus. You can leave them in book stores on benches or set them down on tables of cafe's or restaurants etc,. 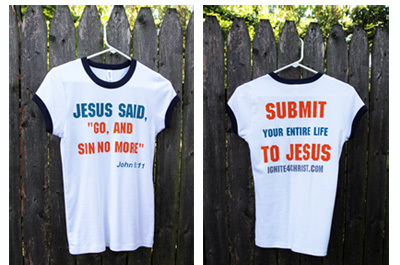 Witnessing for JESUS can be as simple as wearing a shirt that works as a banner for the gospel. You can put scriptures on your shirt or use big bold letters that read something similar to, "Jesus loves you with all His heart", "Repentance is LOVE", "Your Creator wants your friendship" or whatever else He tells you to say. 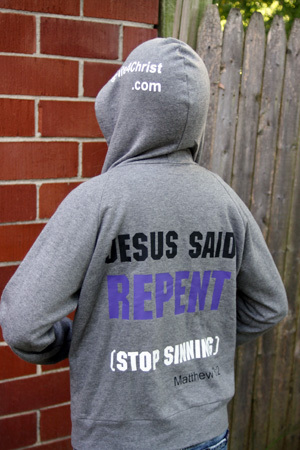 Same with hats, sweaters and other clothing attire, just make sure you aren't condemning people as the "street preacher" groups have taught people to do, always give a message of REPENTANCE & HOPE. If you notice, the world is constantly wearing clothes that advertise their worldly desires (music, movies, bands etc,.). JESUS' children can wear clothes that will speak the TRUTH in His LOVE. Online Community Websites or your own website. Youtube, and facebook are a great tool to use for witnessing to your family, and all others. You can create video testimonies, audio blogs and just be a light for Jesus in what you do with your profile page. Get prayed up and Go Out Witnessing! I take witnessing cards with me everywhere I go and give them to whoever Jesus leads me. If you just walk around crowds, stores, malls or down the street giving out cards/tracts.. then this will help start a conversation and if you allow JESUS to lead you, He will lead you to tell people your testimony, It's all about being lead by His Holy Spirit. One card could change someone's life!! Where do I go Witness? There are many places you can go to share your testimonies and share the gospel. As mentioned above, you can go to malls, streets, stores, public parks, and anywhere that JESUS leads you! Always use common sense, don't put yourself in danger, don't go out witnessing alone, bring a friend and always go to public places where there are people. Jesus has shown me over the last few years that air preaching isn't affective at all, it merely crushes spirits. There are MANY "street preachers" who are walking in pride and condemning people, rather than humbling themselves and sharing the lessons they learned from fiery trials, and rather than sharing their testimonies and Jesus' sound coulsen, they are out there using an air horn shouting at people! You can talk to people one on one, pray and tell people what Christ did for you. Where as, yelling through an air horn may crush ones spirit and make their heart more hardened towards JESUS. There is a right way of wintessing to people and a wrong way, the right way is being led by the Holy Spirit. Imagine what Jesus would do if He were walking on the street, would He use an air horn? Seek the LORD in ALL things, pray for protection and pray for ears and eyes to be opened before you head out. NEVER EVER call people names or speak down to them as though you are better than they are. Calling them things such as "perverts, sissies, idiots" or other hurtful names is NOT glorifying JESUS! Nor is it pleasing Him. A lot of people get filled with pride and puffed up, its very easy to fall into a state of pride if a person forgets that they too have fallen short of the glory of Jesus. Remember to tell others what JESUS did in your heart, how He has changed your lifes. JESUS says to judge a righteous judgment, ask Him for discernment in all things. I hope this helped you to get started on your journey. Jesus Christ bless you. Send us your testimony stories!